Djibouti is a tiny nation sandwiched between Ethiopia and Eritrea in the Horn of Africa. Much of the country remains undeveloped, and as such it's a fantastic destination for eco-tourists looking to get off the beaten track. The interior is dominated by a kaleidoscope of extreme landscapes ranging from plunging canyons to salt-encrusted lakes; while the coast offers excellent scuba diving and the opportunity to snorkel alongside the world's largest fish. The country's capital, Djibouti City, is an urban playground on the rise with one of the region's finest culinary scenes. Djibouti is part of East Africa. It shares borders with Eritrea (to the north), Ethiopia (to the west and south) and Somalia (to the south). Its coastline borders the Red Sea and the Gulf of Aden. Djibouti is one of the smallest countries in Africa, with a total area of 8,880 square miles/ 23,200 square kilometers. In comparison, it is slightly smaller than the American state of New Jersey. The capital of Djibouti is Djibouti City. According to the CIA World Factbook, Djibouti's July 2016 population was estimated at 846,687. More than 90% of Djiboutis are under 55 years of age, while the country's average life expectancy is 63. French and Arabic are the official languages of Djibouti; however, the majority of the population speaks either Somali or Afar as their first language. Islam is the most widely practiced religion in Djibouti, accounting for 94% of the populace. The remaining 6% practice various denominations of Christianity. Djibouti's currency is the Djiboutian franc. For up-to-date exchange rates, use this online currency converter. Djibouti's climate is hot all year round, with temperatures in Djibouti City rarely falling below 68°F/ 20°C even in winter (December - February). Along the coast and in the north, the winter months can also be quite humid. In summer (June - August), temperatures often exceed 104°F/ 40°C, and visibility is reduced by the khamsin, a dust-laden wind that blows in from the desert. Rains are rare, but can be briefly intense especially in the central and southern interior. The best time to visit is during the winter months (December - February), when the heat is at its most bearable but there is still plenty of sunshine. October - February is the best time to travel if you're planning on swimming with Djibouti's famous whale sharks. Founded in 1888 as the capital of the French Somaliland colony, Djibouti City has transformed over the years into a thriving urban center. Its eclectic restaurant and bar scene matches its identity as the second richest city in the Horn of Africa. It is highly cosmopolitan, with elements of traditional Somali and Afar culture blending with those borrowed from its significant international community. Also known as Lac Assal, this magnificent crater lake is located 70 miles/ 115 kilometers west of the capital. At 508 feet/ 155 meters below sea level, it is the lowest point in Africa. It is also a place of great natural beauty, its turquoise waters contrasting with the white salt banked along its shore. Here, you can watch Djiboutis and their camels harvesting the salt as they have done for hundreds of years. In the Gulf of Tadjoura, the islands of Moucha and Maskali offer excellent beaches and abundant coral reefs. Snorkelling, diving and deep sea fishing are all popular pastimes here; however, the main attraction occurs between October and February when the islands are visited by migrating whale sharks. Snorkelling alongside the world's largest fish is a definite Djibouti highlight. In the northwest, the Goda Mountains offer an antidote to the arid landscapes of the rest of the country. Here, vegetation grows thick and lush on the shoulders of mountains that reach up to 5,740 feet/ 1,750 meters in height. 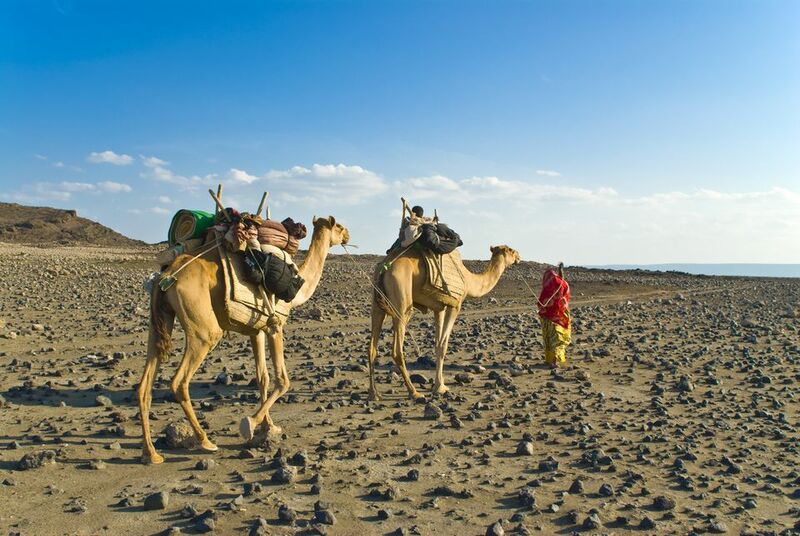 Rural Afar villages offer a glimpse of Djibouti's traditional culture while the Day Forest National Park is an excellent choice for birding and wildlife enthusiasts. Djibouti–Ambouli International Airport is the main port of entry for most overseas visitors. It is located approximately 3.5 miles/ 6 kilometers from the center of Djibouti City. Ethiopian Airlines, Turkish Airlines and Kenya Airways are the biggest carriers for this airport. It is also possible to take a train to Djibouti from the Ethiopian cities of Addis Ababa and Dire Dawa. All foreign visitors need a visa to enter the country, although some nationalities (including U.S.) can purchase a visa on arrival. Check this website or consult your nearest embassy for further information. In addition to ensuring that your routine vaccines are up to date, it is recommended to vaccinate against Hepatitis A and Typhoid before traveling to Djibouti. Anti-malaria medication is also required, while those traveling from a yellow fever country will need to provide proof of vaccination before being allowed into the country. Check the Centers for Disease Control and Prevention website for further details.